Every day we receive requests from people interested in becoming part of Ecobnb, in order to promote their green accommodation or to start hosting eco-travelers. 1. How can I host responsible travelers with Ecobnb? 2. What requirements should I have? Recovery & reuse of rainwater. Your accommodation self-certify the sustainability requirements owned, which are verified (and reviewed) by eco-travelers. 3. What kind of services do you offer? Mainly we sell overnights stay and special offers of eco-friendly hospitality. We do this by powering our search engine, by advertising promotions on google ads and facebook (aimed to specific areas such as provinces and regions); we manage social networks, PR, and we publish articles on magazines and national newspapers through a news agency. 4. How do you manage reservations? Reservations are made through an easy and intuitive online system. Guests will contact you via a message system, which is linked directly to your email. You can reply to the guest‘s request either rejecting it (if you do not have availability) or confirming your availability and indicating the total price. If you do not have availability for the dates requested by the traveler, you can suggest an alternative solution, indicating the different dates and the total price. When the guest receives your availability and price, he will accept confirming the booking. Once the guest has confirmed the reservation, you will receive a message with their contacts (email and phone number). 5. How are traveler’s payments managed? 6. How do accommodation facilities manage the payment process? In most cases, payments are autonomously managed by the owners of the accommodation facility. In this case, Ecobnb will send the contacts of the traveller once the online booking is confirmed. You can decide whether guests should leave a deposit or pay you as they arrive. At any rate, guests will pay you directly. Ecobnb will send you an e-mail confirming the reservation. Here you can clearly see that Ecobnb does not deal with the payments and cancellations for that stay, but that they have to be managed directly by the accommodation facility. If you want to ask for a deposit, you can communicate it directly to the traveller specifying the payment method. We suggest you should also let the traveller know about your cancellation policy. 7. Can I receive the traveler’s payments in an automatic way? Your accommodation facility is based in one of the mapped nations on Stripe. Your accommodation facility (B&B, hotel, etc.) is based in Italy and has a VAT identification number. The automatic payment service in Italy is offered by Ecobnb only to the accommodation facilities that have a VAT identification number. 8. What should I do to receive the traveler’s payments in an automatic way? If your accommodation facility has the right requirements to receive the automatic payments (in Italy you must have the VAT identification number) Ecobnb can manage your payments. In order to do it, you have to complete the section “Invoice data” you can find in your page on Ecobnb. In particular, you have to add the details of your bank account, where you will receive the payments, as indicated in the following image. what should I do to receive the traveller’s payments in an automatic way? You have to fill the “Invoice data” section with the details of your bank account on your Ecobnb page. 9. How do the automatic payments take place? If your accommodation facility has the requirements to receive the payments in an automatic way (in Italy, for example, you must have the VAT identification number. See point 7 in the FAQ), they will be managed through Stripe, a safe online payment service. THE TRAVELER CONFIRMS THROUGH CREDIT CARD: the traveller inserts his credit card data at the moment of the confirmation of his reservation. This way, the corresponding amount of the total cost of the stay will be blocked 60 days before the check-out. RECEIVE THE AMOUNT THROUGH STRIPE: the amount corresponding the total cost of the stay will be transferred on the bank account of the accommodation facility the day of the check-out through Stripe. You will receive the amount according to the transfer timing of your bank and in any case no later than 10 days from the check-out. The extra costs, which are not included in the total cost of the booking indicated on Ecobnb (for example lunches or dinners, or the tourist tax if not included in the indicated total cost), will have to be paid directly by the traveller to the accommodation structure. 10. What happens in case of cancellation with an automatic payment? If the traveler cancels the booking, the accommodation facility gets repaid or not depending on the cancellation policy chosen. The possible refund is made through the automatic payment system Stripe. 11. What happens if the cancellation occurs without the automatic payment system? If your accommodation facility does not use the automatic online payment system (see point 7 in the FAQ), Ecobnb does not take care about the cancellation policy. They will be directly managed by you and communicated to the traveller inside the conversation on Ecobnb, or via e-mail, phone, etc. You will personally arrange the payments by asking for a deposit to your account, for example, and will manage them directly even in case of cancellation. 12. How much does the service offered by Ecobnb cost? 1 month money back guarantee. If for any reason our service does not suit you, we will repay you the whole amount with no questions. 1 moth money back guarantee. If for any reason our service does not suit you, we will repay you the whole amount with no questions. 13. How are the commission payments done (membership BASIC)? If your accommodation facility is in Ecobnb as BASIC, Ecobnb will invoice the 10% (included VAT) of the total amount of the reservation after the traveller’s stay. Ecobnb will send you the invoice by email automatically. If you manage the traveller’s payments directly and you do not join the automatic payment system offered by Ecobnb (see point 7 in the FAQ), you will receive by email the instructions to pay the amount of the commission to Ecobnb. 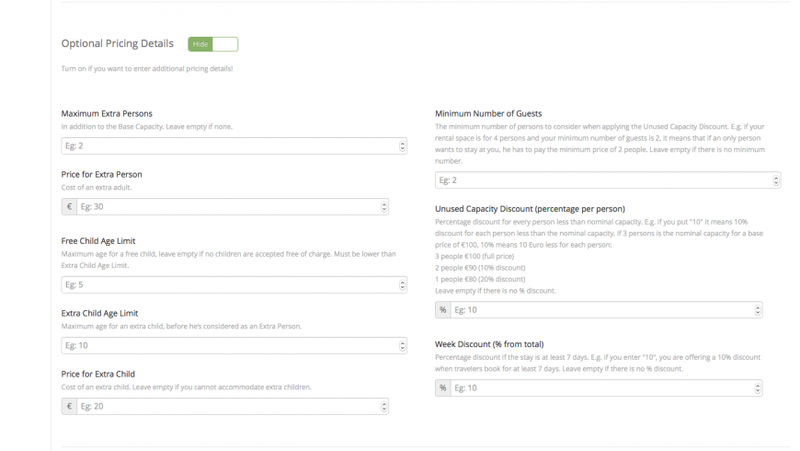 If you have chosen to use the online payment type “Stripe”, the amount invoiced by Ecobnb will be automatically deducted from the total amount of the reservation paid via Stripe (see point 7 and 8 in the FAQ). Finally, if your accommodation structure is registered on Ecobnb with a PRO or PLUS membership, you will have not just more visibility on our website, but you will also have no commission nor other expenses on the bookings you will receive. 14. How does the reservation take place if you have NOT joined the automatic payment? If you have accepted the availability and proposed a total price, the traveler can confirm the booking: you will receive his direct contacts and you can ask him to pay an advanced deposit through a wire transfer or paypal or credit card as a guarantee. The traveler comes, stays and pays his overnight stay. If you are not subscribed with a pro or plus membership, Ecobnb issues an invoice of 10% (VAT included) on the reservation after the stay of the traveler. You will receive the invoice via email with the indications to make the payment. 15. How does the reservation take place in case of automatic payment? If you have accepted the availability and proposed a total price, the traveler can confirm the reservation entering his credit card data. You will receive his direct contacts and the automatic payment system Stripe will block the total amount of the stay within 60 days after the check-out. The day of the check-out the automatic payment system Stripe transfers safely the payment on your transnational account. You will receive the total amount of the reservation from Stripe in the following days, according to the bank transfer timing. If you are in Basic modality (not subscribed in Pro nor Plus membership), Ecobnb issues an invoice of 10% (VAT included) on the reservation and keeps the amount coming from the payment of the stay. 16. After the confirmation of the availability, how long should I block the rooms? Usually the guests/travellers answer (confirming or cancelling the reservation) within 24/48 hours from your message of availability. In order to communicate again with the guest you can click on the blue button you can find inside the email you received from Ecobnb. If you do not receive any answer from the guest within 48 hours from your confirmation, we suggest you should write a message to the guest (by clicking on “send a message”) informing him about the urgency to have an answer or to cancel the availability on the website (by clicking on “refuse the request”). 17. What if a guest cancels the reservation? Guests can cancel their booking by sending an email to info@ecobnb.com and to the email address of the accommodation facility. Ecobnb will cancel the reservation on the database. This way both the traveller/guest and the accommodation facility receive a message confirming the cancellation of the reservation. 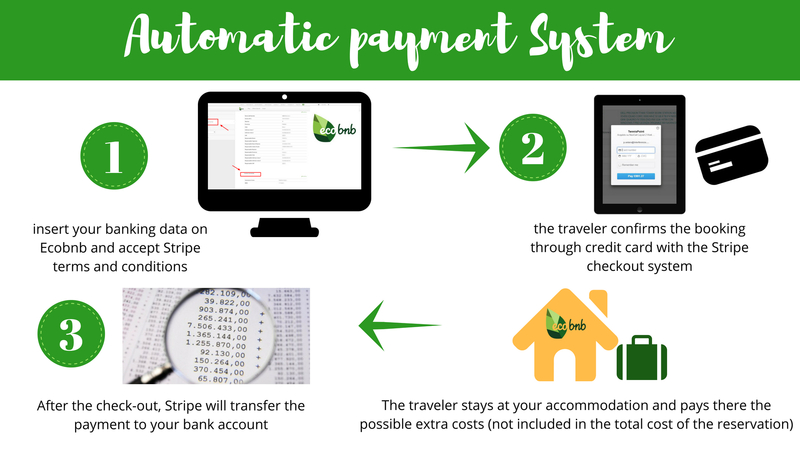 If the payments are managed through the automatic online payment system “Stripe” offered by Ecobnb (see point 7 in the FAQ), the payback of the deposit is made according to the cancellation policy selected, through the automatic system Stripe. If the payments are managed directly by the accommodation facility (not through the automatic online payment, see point 7 in the FAQ), the accommodation facility itself will take care about the cancellation. 18. What are the terms of cancellation of the bookings? If you have not joined the automatic online payment system through Stripe (see point 7 in the FAQ), Ecobnb will not manage the payments and cancellations. You will directly administrate them autonomously and with no limitations set by Ecobnb. 19. Can I indicate different prices throughout the year? Yes, after entering a basic price of the space (room, apartment, etc. 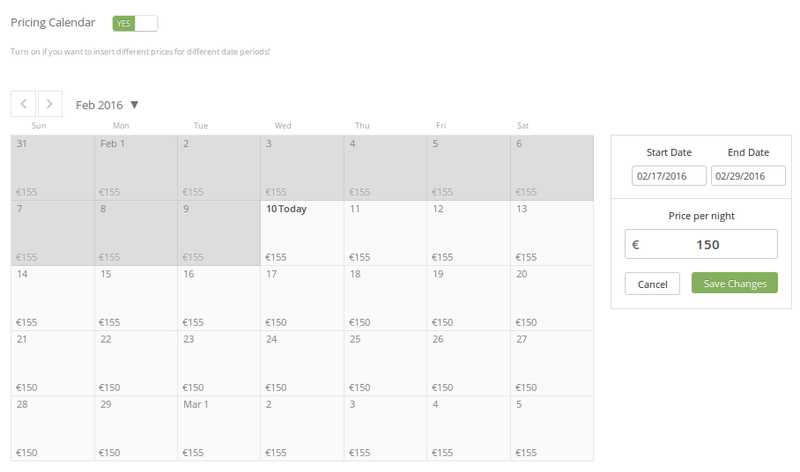 ), you can also enter different prices (higher or lower) throughout the year. select dates, change prices and save. You can indicate different prices throughout the year using the calendar. 20. Is there a calendar of availability? There’s a timetable for each space so that you can enter the prices throughout the year, but there is still no availability calendar. The booking is not done directly, but only after you reply to an availability request sent by a guest. However, you can insert the unavailability periods, corresponding to the closing periods of the accommodation. 21. Can I insert unavailability periods for a single space? Currently you can enter the unavailability periods only for the entire accommodation (see previous question), but not for individual rental space. The booking is not immediate, it always requires your acceptance, so there is never the risk of overbooking. 22. Is there a section in my profile where I can manage the themes of my accommodations? 23. How can I add a special offer? To further promote your accommodation you can, whenever you like, create a special offer such as cooking classes or other workshops, itineraries, discounts, free drinks, etc… Every week we publish the most interesting offers directly on our homepage. Creating an offer is easy: just log in with your credentials on our website, activate the changes and click “Create a new offer.” Now just fill in the different fields. 24. Can I enter a discount for one week-stays or other type of discounts? 25. Can I request a minimum stay? After you have logged into your accommodation page, in the Properties section, in the bottom of the page you will find: Minimum Stay Length (optional). Here you can enter the minimum number of nights required. This number is always applied, not at particular times of the year. If you need to report a minimum number of nights required in a particular period, we suggest you to add it at the end of the description of your accommodation. 26. How can I suggest a green itinerary near my accommodation? If near your accommodation there’s a slow route, to cross on foot, by bike, on horseback or by other eco-friendly ways, you can report it by filling out this online form (the form is in Italian but you may write in english). We will publish the itinerary on our blog, to make it known to travelers and also to advertise your accommodation. 27. To whom should I issue a receipt or invoice? Your invoice or receipt must be issued to the guest and must indicate the data of their stay. If you’re not registered with a PRO membership, once a year you’ll receive an invoice by Ecobnb for the commissions of all the bookings made through the site. 28. How do I get paid by a guest? You can choose the method of payment you prefer. For example you can ask the guest to pay a deposit via bank transfer or via paypal when booking, with the balance at check-in or check-out. 29. How can I unsubscribe and delete my page on Ecobnb? If you want to delete your page on Ecobnb you have to write us at info@ecobnb.com, specifying “delete me” in the subject line of the e-mail. We can put your page “offline” for a short time or forever, according to your requests. As soon as your page is no more posted, it will not appear among the results of the travellers’ research anymore and you will not receive accommodation requests from Ecobnb. You can alway re-publish your page by writing to info@ecobnb.com. Do you want to learn something more about it? Read the answers at the most frequent questions about the project Ecobnb. Haven’t you found the answer to your question? Write us at info@ecobnb.com and we will answer you as soon as possible! You will be able to publish your page again by writing to info@ecobnb.com.